The quality of the olive oil produced this year is much lower than the average of the past years. Our R&D laboratory made its annual analytical study of some samples of olive oil produced in Tuscany and the results obtained confirms a low quality influenced by more than one factor. Actually the problems of the olive harvest started since springtime when a scarce flowering and the difficulties in the fruit set represented an alarm in some districts. In July and August the rain conditioned the olive grove, creating the perfect environment for the develop of the olive fly that did big defects in the fruits. The high levels of the FFA values were surprising since the beginning of the analyses, with values that arrive beyond 0,8%, the maximum limit to classify the olive oil as “extra virgin”. The analysis of polyphenols confirmed as well all the problems of a difficult harvest, presenting values distinctly below the averages of past years. We correlated the polyphenols’ values with the summer rainfalls with to understand better the causes of a so low quality olive oil production in an area where generally the oil produced has a good quality. In the article you will find the results of the study and the figures of the analyses performed with CDR OxiTester, together with a short comment, a comparison with other olive harvest data and an overview of the situation in the oil mills during this year, that turns out a very particular year. Finally some suggestions to check the quality and to avoid bad surprises. The quality of the oil till now produced is remarkably low. The most surprisingly datum emerging from the analyses of our samples is about the value of the polyphenols that are scarce also where the values of FFA and peroxide value are good. What could it be the reason of so low values? All the defects coming from the olive fly affected highly the FFA value but it could be not possible a so strong effect on polyphenols. Given that our annual statistics are made on samples coming always from the same area of origin, where the same cultivar are cultivated, generally milled in the same oil mills, we thought the data of the polyphenols could have been to the summer rainfalls in some way. In the last year we saw a great increase of rainfall in the months of July and August. To verify our hypothesis we considered the previous four years in which we analysed the oils coming from a definite area of Tuscany. 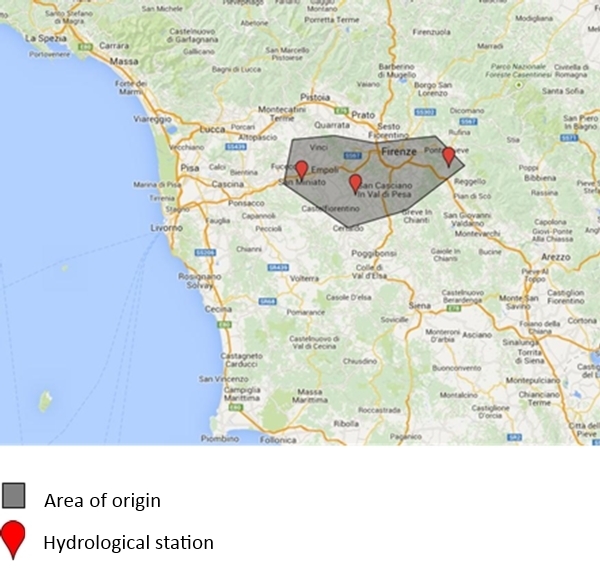 We considered millimetres of rainfalls in this area, taking the average of data surveyed by three hydrological stations. We correlated then the two series of data. In addition to rainfalls, many other data can influence the content of polyphenols in oil: ripeness level of the olives, cultivar, times and methods of extraction. 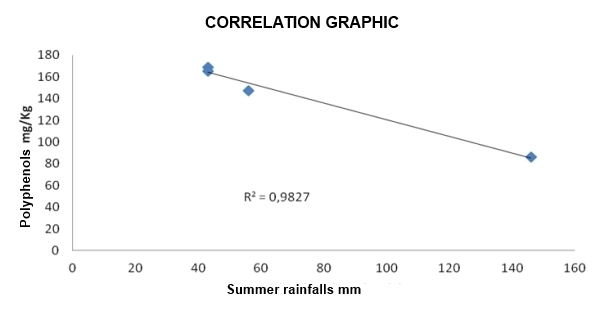 Nevertheless data prove a neat correlation with the summer rainfalls as well. However the rains favour the develop of the olive fly and can be recognized as the main cause of all the criticalities of the olive harvest 2014. Obviously our hypothesis requests further checks and studies extended in time and in space. However it contributes to indicate the trend of an interesting quality parameter, polyphenols, in relation to the climate changing in progress, and to think about the most appropriate interventions to operate in the field or in the mill. The parameters for quality control (FFA, peroxide value and polyphenols) have been checked on samples of oils coming from the Florence and Pistoia districts, received by the Cerbaia cooperative OTA oil mill. 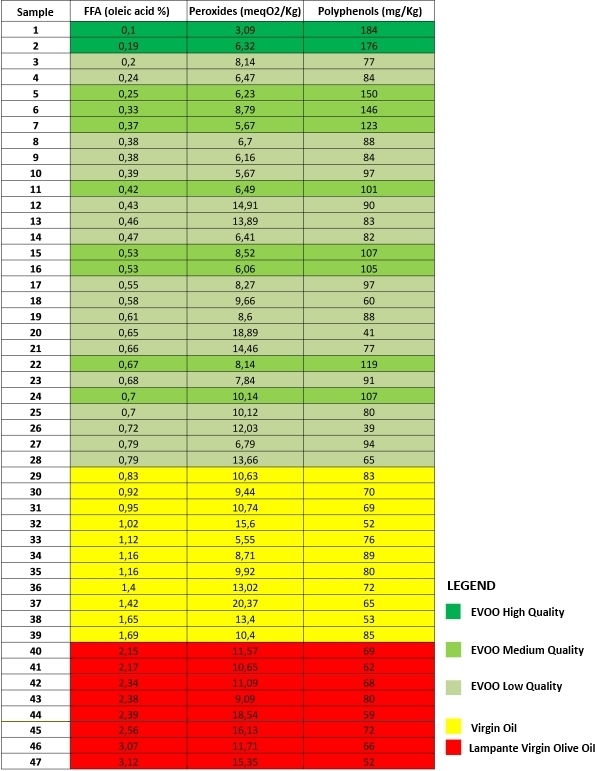 The values of the three analyses performed on the samples, to which has been given a quality index (high – medium – low) mainly based on the value of polyphenols, are reported in the table from the highest to the lowest FFA value. Right the FFA values are the most alarming, because they are in average higher than the values generally found in oils freshly pressed. As shown in the table, the half of the samples are not “extra virgin” but classified as “virgin” or “lampante virgin olive oil”. In conclusion, in comparison with the past seasons, extra virgin oils with a low content of polyphenols, are not going to have the typical scents and aromas of the high quality fresh new olive oil. Moreover it is possible that the oils, scarce from a quality point of view, will have some problems in its preservation. The production activity in the oil mills was brief and earlier than ever. Some small olive growers decided not to harvest because the olives were few or too damaged and even fallen before the complete maturation because of the entity of the damage. Others, after a first harvest phase, suspended the activity because of the low quality of the oil produced. Only the ones who made adequate and frequent treatments with insecticides succeeded in “saving” the harvest and their own oil. Some oil mills ran out last year oil stocks already in September, given the extraordinary requests from consumers and small producers. These stocks, if high quality oil stocks, maintained their initial good features. That probably will not happen with the most part of the oil produced during this olive oil season. Oil analyses were appreciated very much in this oil campaign and represented a very important instrument to manage the “olive oil quality factor” directly at the origin, in the oil mills. They will be important more and more as a way to control, prevent or fight the counterfeits and frauds, a real risk after an olive oil campaign like this. Since ever the oil analysis is a valid instrument to monitor the quality and to avoid bad surprises during production, classification and stocking. Quality control is very useful for oil classification (EVOO, virgin or other categories) and it is a key factor during a critical and uncertain production year like this 2014. Since a long time, inside the oil mills, it is possible to carry out the FFA, peroxide value and polyphenols tests in a simple and rapid way immediately after the milling process, using only one oil drop. Thanks to CDR OxiTester. On production line and in the storehouse it is possible to carry out an accurate quality control that is enhanced and intensified during a special year like 2014. Given that a climate changing is in progress and the market evolves, a control at the beginning of the production chain will acquire an increasing importance in the olive oil sector. Olive oil analyses: the quality of 2014 olive oil was last modified: February 8th, 2019 by CDR s.r.l.